Renowned Dallas Plastic Surgeon Dr. Sameer (Sam) Jejurikar, a down-to-earth doctor who has always been very active in the community and is warmly referred to by his patients as “Dr. J,” has just returned from yet another mission trip to Bangladesh with the charitable organization Smile Bangladesh. One of Dallas’ most respected physicians, Dr. Jejurikar is a board-certified plastic surgeon practicing at the prominent Dallas Plastic Surgery Institute and is associated with several hospitals in the area including Presbyterian Hospital Dallas (of which he is Vice Chair of Plastic Surgery) and Medical City Plano. Dr. Jejurikar has been active in his local Dallas/Ft. Worth community for over 10 years, and is also involved on a national and international level in projects that focus on patient safety, as well as charitable mission projects such as the cleft palace surgeries he has performed for needy children through Smile Bangladesh. The mission of Smile Bangladesh is to provide appropriate medical care for children and adults with facial cleft deformities in Bangladesh and other developing countries around the world. Under the leadership and guidance of president and founder Shahid R. Aziz, DMD, MD, FACS the organization brings together medical professionals working in different specialties who volunteer to travel and provide cleft palate repair surgeries for impoverished populations in these countries. Bangladesh is a South Asian country in the Indian subcontinent that is bordered on almost all sides by India, also sharing a small border with Burma/Myanmar on the far southeast side, with a coast along the Bay of Bengal to the south. Once a part of India, Bangladesh was established as a separate nation during the Partition of Bengal and India orchestrated by the British in 1947, when the region was designated as the eastern wing of the newly formed nation of Pakistan. So it is unfortunate that an estimated 300,000 children and adults in Bangladesh are afflicted with cleft deformities that may cause difficulty eating as well as impairments in speaking their beloved language, not to mention also affecting the appearance of those affected by the condition. Still more unfortunate is the fact that there are roughly only about 30 surgeons in Bangladesh with medical training in cleft repair surgery, which translates to about 10,000 cleft patients per surgeon. For this reason, Smile Bangladesh was founded to provide free surgical care for afflicted individuals by supporting teams of volunteer surgeons, anesthesiologists, and nurses from around the world who are willing to visit impoverished areas of Bangladesh and other developing countries to perform facial cleft repair surgeries on local citizens who cannot afford to pay for the procedure. On his most recent trip with Smile Bangladesh, Dr. J spent a period of 4 days performing surgeries, and along with his team of three attending surgeons and eight resident surgeons, as well as volunteer nurses, anesthesiologists, and other skilled medical professionals, performed over 40 cleft lip and palate surgeries. These surgeries not only restore healthy oral function, as well as improved speaking ability, to the patients who undergo them; they also restore dignity and self-confidence, often transforming entire lives. Dr. Jejurikar is a board certified plastic surgeon with a practice in the Dallas-Ft. Worth area of Texas, specialized in facial surgical and non-surgical cosmetic and reconstructive procedures, in addition to breast and body procedures. Dr. Jejurikar has earned an excellent reputation not only in his local community but also at the national and international level, thanks in large part to his commitment to constantly improving his own training, knowledge, and expertise in the area of cosmetic and reconstructive surgery. He has also received recognition among his local, national, and international peers in the medical field for his commitment to advancing the field of cosmetic and reconstructive surgery through ancillary activities focusing on such things as patient safety and charitable projects serving needy patients. For example, Dr. Jejurikar is active in such critical projects as the Multisociety Gluteal Fat Grafting Task Force, an international task force that focuses on improving patient safety during gluteal fat grafting procedures, a procedure that has a higher risk of complications than other cosmetic procedures. He is also involved in such endeavors as these charitable mission trips to provide free surgery for impoverished communities through Smile Bangladesh. In fact, for years he has been passionate about providing free reconstructive surgery to the world’s most impoverished communities, and Dr. Jejurikar has proudly performed hundreds of cleft lip and palate surgeries for children and adult patients in countries in South and Central America, as well as in Asia, on these charitable missions. 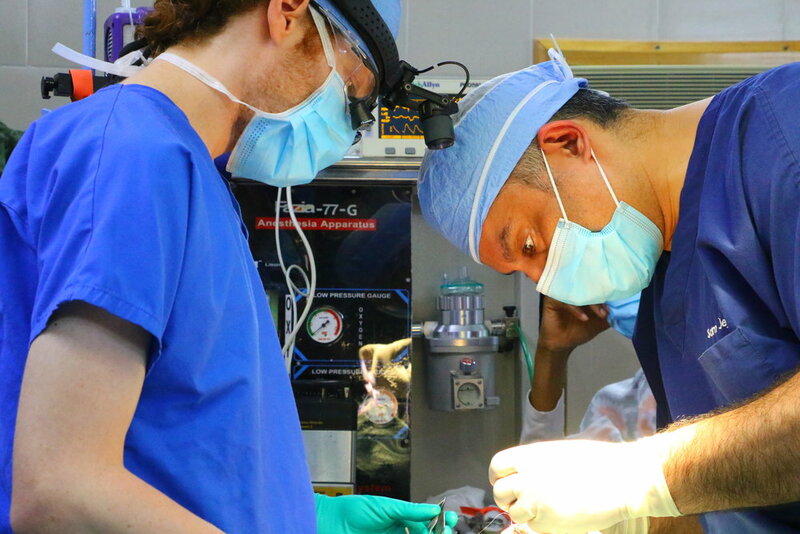 Dr. J’s visit to Bangladesh to perform reconstructive cleft palate surgery in 2018 was his fourth such trip to provide this crucial service free of charge for patients who cannot afford to pay for it. These charitable trips are a central and critical part of Dr. Jejurikar’s personal mission as a physician, while also attesting to his commitment to caring for patients in need. Following his most recent participation with Smile Bangladesh, Dr. J was invited to join the organization’s Board of Directors, an honor that he was thrilled to accept. As a Board Member of Smile Bangladesh, Dr. Jejurikar’s personal level of giving may be increased, as the organization helps to facilitate contributions of volunteer time by dozens of other doctors. Dr. Jejurikar has a number of research grants and fellowships from celebrated medical organizations such as the National Institutes of Health Training and the Plastic Surgery Educational Foundation under his belt, and has been a contributor to over 15 peer-reviewed research publications. He is also a noted speaker on topics related to his research and clinical expertise in cosmetic and reconstructive surgery.